Once the noble Avenger of the Pantheon, Aggramar was struck down by Sargeras and reborn as a titan of destruction. He now stands at the core of Argus, guarding a power that could unmake the universe. 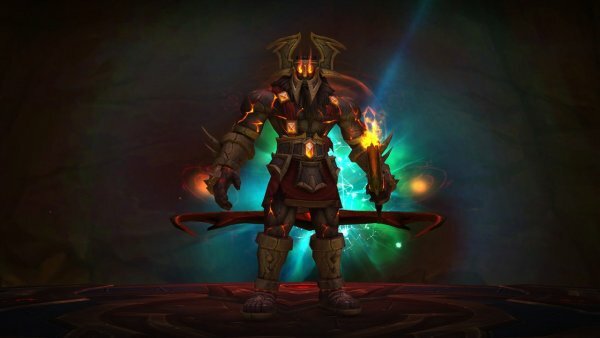 Not even demons are permitted to tread within the titan's halls, and any mortals bold enough to trespass will be reduced to cinders by Aggramar's burning blade, Taeshalach. This fight is a long one and has 3 phases and 2 intermissions. In this phase, the boss will put fire debuffs on players that they need to master. The boss will also shoot fire waves from him that must be dodged. The boss also has an energy bar. When reaching 100 energy he will cast an in which the raid must share damage and an ability in which the tank must take dmg alone. Boss does 1 ability on tank that needs to be tank swapped every 13 second (Taeshalach´s Reach). Tanks must be close to boss and melee must be at max range. Boss puts two different debuffs on random players. Boss shoots big fire waves from him and must be dodged. When boss reaches 100 energy he does 2 abilities several times and finish of with a blast. - When Foe Breaker -> 1 tank in front of boss, use defensive. - When Flame Rend - > Turn the boss to raid and raid stack behind boss to share frontal damage. Tank swap after Flame Rend. During this phase, the boss has a shield around him. Touching the shield does dmg and a knockback. Fire fragments will fall on players location periodically. Two Fire elementals will spawn that does more dmg over time. Small ember adds will spawn that moves to boss and if an ember reaches the boss, he will do an explosion. G1 on left and G2 on right side where elementals spawn. Nuke one ember on each side first to clear way for Fire elemental to be tanked. Nuke Fire elemental fast while cc embers. Healers raid heal when ember reaches 100 energy/reaches the boss. Normal mode: Run away from the three locations on the ground that blows up. 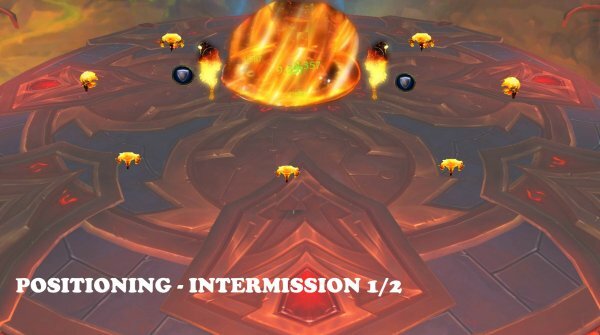 Same as intermission 1 but fire waves from boss is added, pay attention on them when nuking adds and move away. Tank boss on center of the platform. Both tanks must be closest to boss. Spread out on left and right side of the platform. Spread out so all players are in range for heals. All melee attacks also do damage to closest players. If no player is close, the main tank takes that damage. Each melee strike leaves a debuff on main tank. This debuff increases physical dmg taken by 5% for 12 seconds and stacks. Stand at max range from boss. Stack on top of each other and stand close to boss. Random player’s gets a fire debuff (ignite) that does fire ticking fire damage (every 0.5 sec for 1.5 s) damage to any player within 4 yards. stay spread from each other at least 4 yards. Be ready to heal the targeted players up again fast. The fire damge is around 50% hp in total. Boss shots several fire waves from him that travels through the platform. Players hit by the fire wave will take high/deadly fire damage and will also get a debuff that does fire damage every 2 sec for 12 seconds. Stay max range so you can dodge the fire waves easier. Run away before the boss casts the wave so you can dodge them. 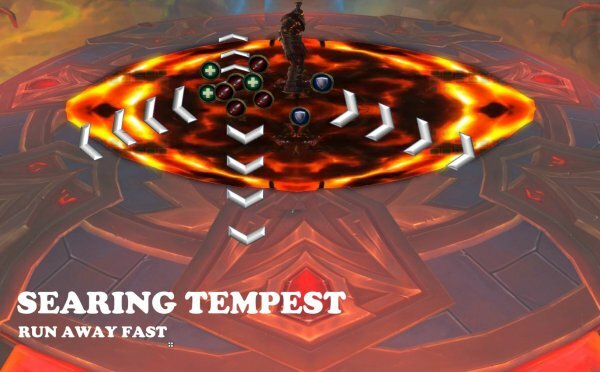 When boss reaches 100 energy, he will cast 2 different abilities several times (Foe Breaker and Flame Rend) and end with an ability called Searing Tempest. Does several million frontal cone physical damage. Player hit will have 500% increased dmg taken from Foe Breaker for 30 seconds. Boss does loads of million fire damage in a frontal cone. Players getting hit will split the damage evenly. Players getting hit will also get a knock back. 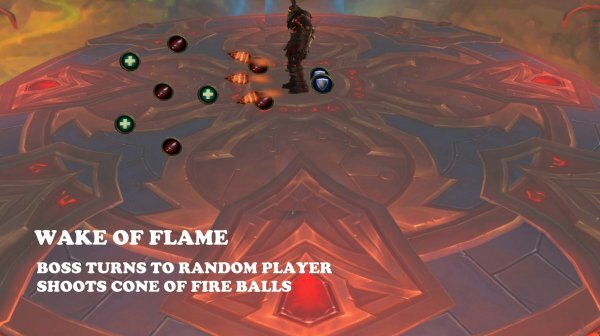 Players get a debuff that increase damage taken by 500% from Flame Rend when they are hit by it for 30 seconds. At the end, when boss is done with the Foe Breaker and Flame Rend, he will end with Searing Tempest. This is a big fire blast within a big radius around the boss and does several million fire damage. Boss will do this 2 times before he puts a fire shield circle on him that does high dmg and disorients if touched. This starts intermission phase. Face the boss away from Raid when he does Foe Breaker and use Mitigation (defensive cooldown). 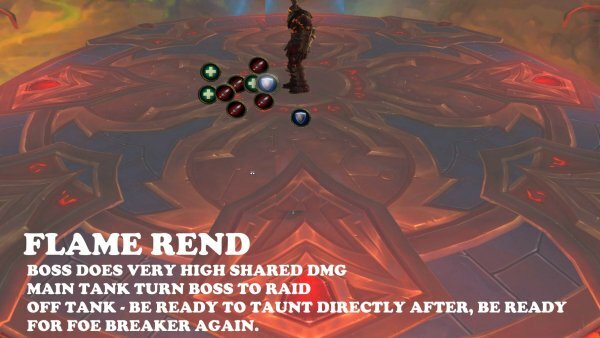 Turn the boss to Raid after Foe Breaker so the Flame Rend hits the raid. You will get knocked back from Flame Rend as well. 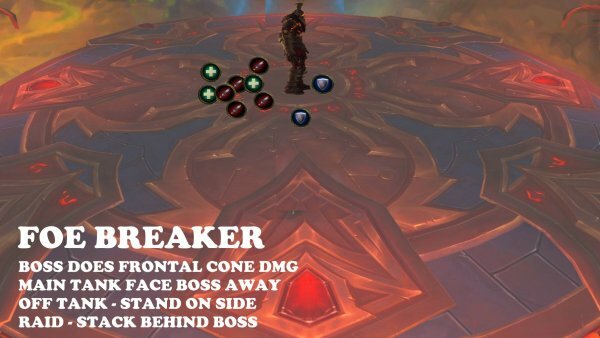 Stand behind boss when Foe Breaker is on main tank. Turn behind boss again when main tank turns boss to raid for Flame Rend. Taunt boss directly after Flame Rend and make sure he is turned away form raid for the next Foe Breaker. Everyone stack up behind boss. After Flame Rend you get knocked back. Run directly behind boss after that. Boss will cause meteors to fall on player locations, that do high fire damage if getting hit. - Two Fire elementals will spawn on each side of boss that do more dmg over time. Ember adds will move to Aggramar and if they reach him, it will cause Blazing eruption. Ember adds They generate energy, and after reaching 100 energy, they cause Blazing eruption. When they die, they turn in to a pool on the ground for 18 sec, that does ticking dmg. Heroic Mode: The pool will reform after 18 sec and starts to move to boss again. If they are within 15 yards of the Fire Elemental, they gain increased movement speed by 100%, becomes immune to CC and 50% increased damage. High fire dmg to all players and a fire debuff that does dmg every 1 sec for 15 sec. Each time Blazing eruption happens, it will increase the next one by 100% if it happens within 15 sec from the previous one. Two fire elementals spawns on each side of boss and can be tanked. If they are close to any add (15y) , they will boost them, increased movement speed by 100%, becomes immune to CC and 50% increased damage. The key is to kill the elemental adds fast before they are OP and kill the raid. 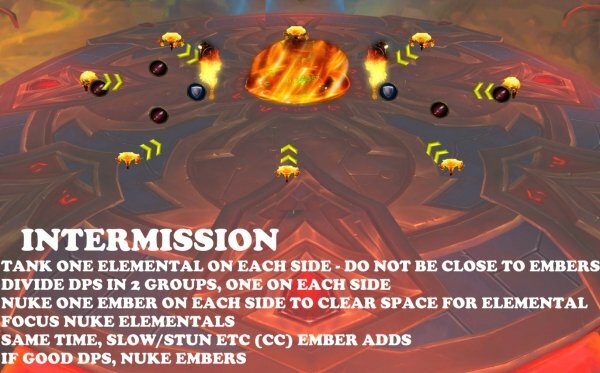 At the same time, the players must master the Blazing eruption, cc the small adds moving towards boss and not let to many hit boss at the same time. Tank add between center and the edge of platform. An ember will be killed asap so you can tank there. Be ready to heal when embers reach 100 energy. Be ready to raid heal if an ember reaches the boss. Healer(s) must be focused on tanks. Beware of fire fragments that falls on player´s location. Wake of Flames (frontal cone fire balls) is replaced with Flare. 3 Locations on the platform are marked. After 4 seconds, they explode and do several million fire damage to any player hit by it. Run away from the 3 locations fast. Position yourself asap when it´s done. Same as Intermission 1 but with one extra ability: Wake of Flame is added as well. Players hit by the fire wave will take fire damage high/deadly fire damage and will also get a debuff that does fire damage every 2 sec for 12 seconds. ALWAYS pay attention of these flames while you nuke embers and fire elemental. Same as phase 2 with one extra touch, the flare is now empowered. 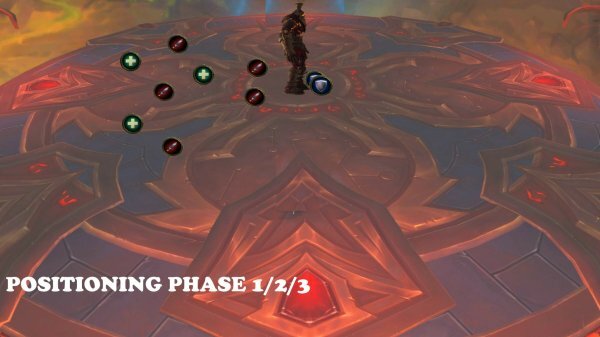 Wake of flame will radiate out from each marked location. More movement in this phase to dodge the flames. Focus on survival first because the fire dmg is very high if you take dmg. Healers beware of high fire damage if players take dmg, they will also get a fire debuff.